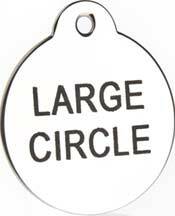 Hard Wearing Stainless Steel Pet Tags, Dog Identity Engraved with FREE UK Delivery. Rather than using traditional engraving methods. We now laser mark our stainless steel tags. Our Laser marking gives an Excellent quality finish and has our own Lifetime Guarantee not to wear off or fade. Our Price From: £6.65 .